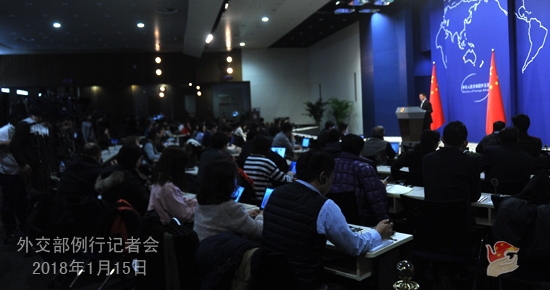 First of all, I know that many of you went to the new year reception last Friday jointly hosted by the Foreign Ministry and the Beijing municipal government. I want to thank you for your attendance. I am sure that you all had a great time chatting with the officials and spokespersons of the ministries and departments. At the invitation of Professor Klaus Schwab, Founder and Executive Chairman of the World Economic Forum (WEF), Liu He, member of the Political Bureau of the CPC Central Committee, General Office Director of the Central Leading Group for Financial and Economic Affairs will attend the World Economic Forum Annual Meeting 2018 in Davos, Switzerland from January 22 to 25. Q: According to the Indian media, on January 12, Indian army chief General Bipin Rawat said at a press conference that China is a powerful country, but India is not a weak nation, and that India should shift its military focus to the northern border. He added that the Dong Lang area doesn't belong to India and that Indian soldiers did cross into foreign territory during the standoff. What is your comment on those remarks? A: We have taken note of relevant reports. The past one year witnessed some twists and turns in China-India relations. On the sidelines of the BRICS Summit in Xiamen last September, the two leaders reached important consensus on properly handling differences and bringing China-India relations back to the track of sound and steady development. Recently, the two sides have enhanced dialogue and consultation and bilateral relations in general have shown a positive sign of improvement and growth. Against such backdrop, all the unconstructive words about shifting military focus to the northern border by this Indian senior military officer as you mentioned, which ran against the important consensus reached by the two leaders and the bilateral efforts to improve ties, work against jointly upholding peace and tranquility in the border areas. China and India are each other's important neighbors. Both of us are at the critical stage of national development and rejuvenation. The two countries should step up strategic communication, disperse strategic misgivings and conduct strategic cooperation. We urge the Indian side to observe the important consensus reached by the two leaders, contribute to peace and stability in the border areas, and refrain from doing anything that may complicate the situation. Relevant affairs between the two countries shall be handled in a constructive manner so as to promote the sound and steady development of bilateral relations. That, we believe, serves the common interests of the region and the interests of the Indian side as well. One thing I would like to point out is that the remarks of this officer once again proved the irrefutable fact and clear-cut nature of that illegal border-crossing incident by the Indian troops last year. The Dong Lang area belongs to China. The Sikkim Sector of the China-India boundary has been delimited by historical conventions. The Dong Lang area is China's territory. 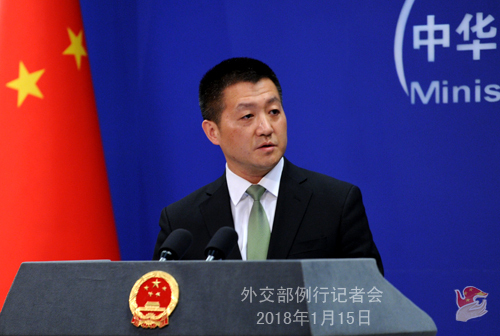 China will continue exercising its sovereignty over the Dong Lang area in accordance with the stipulations of historical conventions and steadfastly uphold its territorial sovereignty. We ask the Indian military to learn its lessons from that incident, abide by historical conventions and earnestly uphold peace and stability of the border areas, thus creating favorable atmosphere for the positive development of bilateral relations. Q: Yesterday, the oil tanker Sanchi sank after explosion. Can you give us more details? What is China's plan regarding the next steps in dealing with this accident? A: This maritime disaster has been in the headlines for several days. So, today, I want to take some time and go through the relevant details. The Chinese leaders and government take this maritime traffic accident very seriously, and the general public has been following its development. The competent departments responded very swiftly and has been pulling all-out efforts for search and rescue. As reported, it was a gravely dangerous situation when Sanchi collided and caught on fire with 136,000 tons of condensate oil aboard. Despite all that, out of a strong sense of professionalism, the Chinese rescuers put their lives on the line and braved safety threats to approach the burning vessel multiple times, carrying out search and rescue and fighting the fire at very close range. Just before the explosion occurred, they even boarded the vessel and brought back two bodies and the voyage data recorder, or what we call "black box". During the whole process, the communication between the Chinese side and the Iranian departments has been smooth and effective. So is that between China and Bangladesh. The Chinese Embassy in Iran approved visas for the Iranian professionals as quickly as possible so that they could come here, get to the site and take part in the rescue efforts as soon as they can. China's rescue command center also made special arrangements for them in order to facilitate their coordination and communication with the Chinese side. Besides, we have been working with Japan and the ROK in the rescue operations. You may have noticed that the Iranian Labor Minister said in a letter to President Rouhani that according to the opinion of the Iranian experts and Chinese officials, all the crews on the tanker had died within an hour after the accident happened because of the large-scale deflagration and the toxic gas. We are all sadden by this tragic ending. In the meantime, China's search and rescue work is highly approved by the Iranian side. Just like the vice chairman of the national security committee of the Iranian parliament said to the press, both China and Iran had made the utmost efforts. The Iranian minister for cooperation, labor and social welfare expressed appreciation for China's efforts. The Iranian Ambassador to China also said that China not only mobilized its resources in Shanghai but also drew support from neighboring provinces in its all-out efforts. The Iranian consular-general in Shanghai also thanked China's utmost efforts. We express our condolences to the victims and sympathy to the bereaved families. We will remain in touch with the Iranian side and properly handle follow-up matters. At the same time, I would like to express my respect and gratitude to all the rescuers who are best examples of bravery and professionalism. Q: What is China doing to prevent any environmental disaster? And also have there been any preliminary results on the cause of the accident? A: For your first question, I believe I have said in my answer to the previous question that because human life is at stake here, so China organized search and rescue operations the first time possible, hoping that we could get all the crews back. Considering the large amount of condensate oil on the vessel, China also started cleaning and preventing efforts. You may refer to the websites of the Transportation Ministry and the State Oceanic Administration for details and for the latest updates. For your second question, what mattered most when the accident happened was rescuing and saving lives, and meanwhile we never stopped looking at the cause of the accident. Even before the final fateful explosion, the Chinese rescuers boarded the vessel with no consideration to their own safety because of a slim hope that someone might still be alive. They recovered two bodies and the voyage data recorder. I believe that the "black box" will shed some light on the cause of this accident. More investigation will follow after that. Q: Can you confirm that investigation has started? A: The investigation is underway. Q: Could you give us some details about how the investigation will be carried out? Will China be leading the investigation and do you have a time frame when you expect such investigation to be completed? A: As I said, the "black box" will help lead us to the cause of the accident. Since the investigation is still underway, I suggest we all be patient for the result. Q: The Japanese government has confirmed that it was a Chinese military submarine that entered the contiguous zone near Diaoyu Dao on January 10 and 11. The Japanese Foreign Ministry has summoned Chinese Ambassador for protest. What is your response? According to the Chinese side, the Chinese "Yiyang" frigate only entered the contiguous zone when the Japanese vessels were spotted there. But the Japanese side is contending the contrary. What is your comment? A: The spokesperson of the Chinese Defense Ministry already explained the situation in detail. Last week, I also made clear the position of the Chinese government on the issue of Diaoyu Dao. I am not aware of the situation involving the submarine, but I can tell you that on the issue of Diaoyu Dao, China will not accept the so-called representations. Our position that Diaoyu Dao and the affiliated islands are China's inherent territory is quite clear. And based on this position, China has made its solemn position clear to the Japanese side concerning the Japanese vessels entering the contiguous zone near China's Diaoyu Dao. We urge the Japanese side to stop stirring up troubles on this issue, adhere to the four-point principled position reached between the two sides in 2014, work with us towards the same direction, and make concrete efforts to improve and develop bilateral ties. Q: For what you said about the comment by the Indian army chief, he also said that China was exerting pressure along several border areas and India has made sure the situation did not escalate beyond certain point. Maybe through his comments, he wanted the Indian public to know that he was praising about the India-China relations. What exactly you have taken exception to his comments? A: I have made myself clear just now. If this senior officer was referring to China's Dong Lang, this particular area, then I believe you are quite clear about our position. The Dong Lang area has all along been part of China and under China's continuous and effective jurisdiction. And we are exercising our sovereignty rights and upholding territorial sovereignty in accordance with the stipulations of historical conventions by stationing Chinese border troops in the Dong Lang area and having them patrol the area. I said just now that we hope the Indian side could learn its lessons from that and avoid a recurrence of last year's events. If he was referring to the general situation of the China-India boundary, just now I also said that on the sidelines of the BRICS Summit in Xiamen last September, the two leaders reached important consensus. Over a period of time, in line with the consensus, both sides have maintained effective communication on the whole, to the purpose of increasing strategic mutual trust and reducing strategic misgivings in a bid to create sound atmosphere for bilateral strategic cooperation. Actually, the China-India relations have been enjoying a momentum of improvement and development for some time. Against such backdrop, the remarks of this senior officer do not conform to the consensus reached by the two leaders or the general trend of improving bilateral relations and promoting strategic cooperation. We believe that those remarks are not conducive to the joint efforts made by the two countries to uphold peace and stability of the border areas and do not serve India's interests. Q: Iran and some major powers rejected any modification of the comprehensive nuclear deal after President Donald Trump demanded tough new measures to keep the agreement alive. Does China have reaction to this? A: We put out a statement over the weekend. We have taken note of the relevant US statement, especially the part about continuing suspending sanctions against Iran in the nuclear field. We have also heeded that the international community universally supports the JCPOA and fully recognizes the efforts made by Iran to implement it. The international community including Iran all responded to the US statement. China's position is very clear. We always support the JCPOA, an important outcome of all parties' strenuous efforts. We also hope that all relevant parties could fulfill their obligations in accordance with the JCPOA. 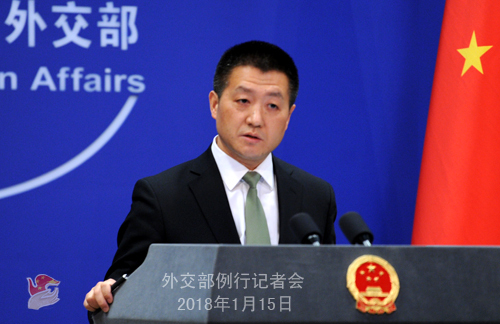 China believes that the JCPOA is an important outcome of multilateralism and a model of resolving international hot-spot issues through political and diplomatic efforts. Ensuring the thorough implementation of the JCPOA is of great significance and relevance to upholding the peace and stability of the Middle East and the international non-proliferation regime and serves the fundamental interests of all relevant parties. In light of the latest development, we hope that all parties could cherish the deal even more, bear in mind the larger and long-term picture, steady their political will, properly manage differences, and continue with their comprehensive and effective implementation of the deal. Q: Reports say that there is a ten-mile-long oil slick in the waters. I would like to know if China has coordinated with Japan on this surface clean-up work. Or whether China is taking main responsibility for cleaning up? A: Back to the first time I took a question regarding this accident, I had talked about China's position and measures we took to prevent large-scale contamination and secondary disasters. I would like to repeat that this work has always been the priority of our focus and actions. An occurrence of large-scale secondary disasters is the last thing we want to see. 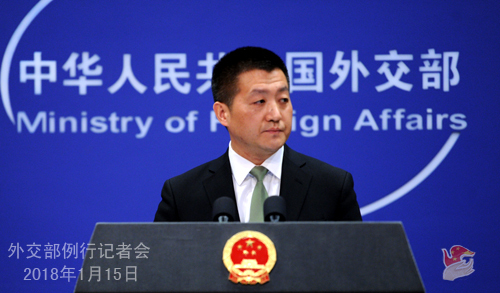 In our dealing with this accident in the East China Sea, we have been transparent and open. We support and welcome other parties' participation in the search and rescue and cleaning-up. As for the concrete details, I would refer you to the websites of the Transportation Ministry and the State Oceanic Administration. We will also keep you posted on the latest information. Q: Indian Army Chief Gen Bipin Rawat also said that the number of Chinese troops has come down significantly in the Dong Lang area. You gave the response last week. I was wondering if you have anything to add to that comment. A: The Dong Lang area has all along been part of China and under China's continuous and effective jurisdiction. There is not the slightest dispute about that. And we are exercising our sovereignty rights and upholding territorial sovereignty in accordance with the stipulations of historical conventions by stationing Chinese border troops in the Dong Lang area and having them patrol the area. Q: Yesterday in Hawaii, there was an accidental message sent to the residents about an incoming ballistic missile which was incorrect. This caused a lot of panic. I am wondering if the US government contacted China before or after the situation to express any sort of clarification. What your response to that mistake? A: I cannot understand the logic behind your first question, so I have no response to that. We have noted relevant reports. This case is another proof that the highly interconnected world calls for greater mutual trust so as to realize development altogether. We believe that if more efforts could be made in that regard, there would be less and less mistakes like this one and the social unrest they entail. Q: An Australian official said that China's assistance to the Pacific Islands countries only increased their financial burdens. What is your comment? A: We've seen these reports as well. Frankly speaking, something might be wrong with the mindset of the person who said those things. All these groundless accusations against China are borne out of their reluctance to see the Pacific Islands countries realizing independent and sustainable development. On the basis of fully respecting the will of the governments and peoples of the Pacific Islands countries and their development needs, China has been assisting them within its capabilities with no political strings attached in particular, and such assistance has greatly boosted their socio-economic development and received warm welcome. I can tell this Australian official and the international community at large that China will continue with such support and assistance to the Pacific Islands countries. Q: The China-aided projects for Stinson Parade Bridge and Vatuwaqa Bridge in Fiji were open to traffic. Do you have more details? A: On January 11, Fiji's Stinson Parade Bridge and the Vatuwaqa Bridge, constructed with China's assistance, were open to traffic. The Fijian government held a grand ceremony for that. Fijian Prime Minister Voreqe Bainimarama, government officials and 300-plus local people took part in that ceremony. Prime Minister Bainimarama said in his speech that China is Fiji's staunch cooperation partner and sincere friend. He thanked the Chinese government and enterprises for helping Fiji build these two marvelous bridges. These two bridges were built with China's free assistance to Fiji. They will greatly improve the traffic and transportation conditions in the capital Suva and facilitate local people's lives. They are just two of the many aid projects we provide to the Pacific Islands countries which take into account the practical needs of the relevant country and are well received by local governments and peoples. I want to reiterate that China will continue with such support and assistance to the Pacific Islands countries to the best of its capability. Q: The US dollar has been at the historical low in the past year. The Chinese yuan is at a two-year high of close to 6.4. Is China concerned that the US is manipulating its currency right now over trade issues? A: That is a good question. The US foreign exchange and monetary policy is up to them to explain. For China, our position on reforming the RMB exchange rate formation mechanism is clear. We hope that major economies could adopt responsible monetary policy and their macro-economic policy could follow the principle of mutual benefit and win-win results. Q: On January 12, the Croatian Transportation Ministry announced that a Chinese consortium led by China Road and Bridge Corporation (CRBC) has won the bid for the construction of the Peljesac bridge, a project sponsored by the EU fund. This is the first time that Chinese companies won the bid for projects sponsored by the EU fund. What is your comment? A: China and Croatia enjoy traditional friendship and the bilateral economic and trade cooperation has been growing with a sound momentum, showing immense potential. In recent years, we have seen more and more Chinese enterprises cooperating with other countries on major construction projects through international bidding. We congratulate the Chinese consortium led by China Road and Bridge Corporation for winning the bid for the construction of the Peljesac bridge. We believe this project will prove to be a strong boost to the bilateral practical cooperation between China and Croatia and the China-Croatia-EU trilateral cooperation. As you said, this is the first time that Chinese companies won the bid for projects sponsored by the EU fund. China supports its enterprises' active participation in the infrastructure projects of other countries based on the principle of equality, mutual benefit and win-win results so as to drive the local socio-economic development.